The biggest battle rap event to hit Massachusetts goes down May 16. 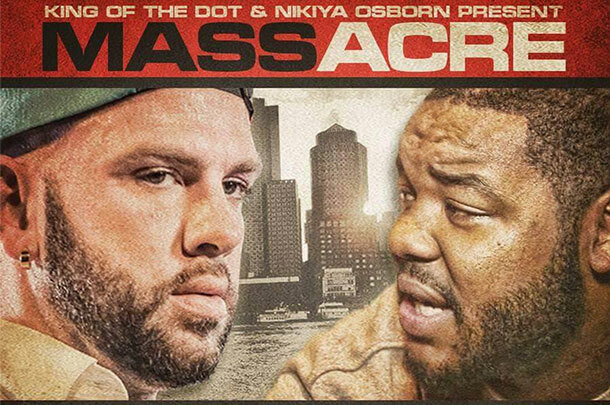 King Of The Dot, in conjunction with Nikiya Osborn, has released the full card and trailer for the upcoming “Massacre” event scheduled for May 16 in Holyoke, Mass. The card itself has been floating around message boards for several months, but the official event details are now finalized and promo has begun. Nikiya is a huge battle rap fan with promotion experience who has been wanting to host an event in Massachusetts for some time now. If you’re scratching your head wondering where you’ve heard his name before, Lush One mention him a few times in previous interviews with BattleRap.com. He's also the man responsible for getting DNA as a last-minute replacement opponent for Rone after Uno Lavoz cancelled at KOTD's "Flatline 3." It’s worth mentioning that “Massacre” goes down in the middle of a busy week for battle rap. It's a week after SMACK/URL’s "Night Of Main Events 5" on May 9 where Charlie Clips faces off against Hollow Da Don in one of 2015’s most anticipated match-ups, and the day before Queen Of The Ring’s "Panic Room 3" on May 17 where 40 B.A.R.R.S. is in the main event against Chayna Ashley. There has been some blowback from fans and spectators online regarding the rematch between Arsonal and Shotty Horroh, the first of which is at more than 6.5 million views on Don’t Flop’s YouTube page and rising. As for the rematch, the original is one of the most entertaining battles ever. Why wouldn't you want to see a rematch? Some of the greatest boxing matches of all time are rematches, same with many competitive sports. Why couldn't we do the same with battles? Both mc's are very excited for this rematch which also means they're motivated to put on a good performance, it's also in a different setting being in a much smaller room which I'm interested to see what kind of effect that has on the battle. The event will have a live pay-per-view hosted by BattleRap.com editor-in-chief Chris Mitchell and Dirtbag Dan. “Massacre” goes down on May 16 at the Waterfront Tavern in Holyoke, Mass. That's the same venue that hosted 413 Battle League's "Superbowl III" event on Jan. 30. Buy the PPV for the event here. Thoughts? Let us know in the comments section.